6 Responses to Do Americans Trust Goverment Less Because It’s Become an Insurance Broker? Entitlement spending may not affect trust in government, but it must surely affect the number of cyclones. 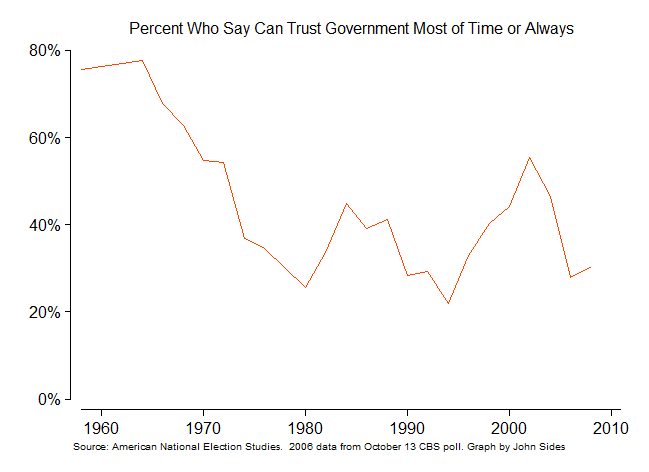 The big spike up in “trust government” is obviously 9/11. I think you have to look at 2002 and 2004 as outliers due to an exogenous shock. Take those out and the trend still looks good, albeit noisy. In fact, the 1974-2008 flattening is a strong argument in favor of the the thesis – the Great Society increase in social insurance occured in the ’60s. Since ’74 the trend had been, until Bush, much slower growth in entitlements. rvman: First, the spike you’re pointing to began in the 1990s, well before 9/11, and is more connected to the growth in the economy. Second, if you take out 2002 and 2004, that does nothing to affect the lack of relationship between 1974-2008. 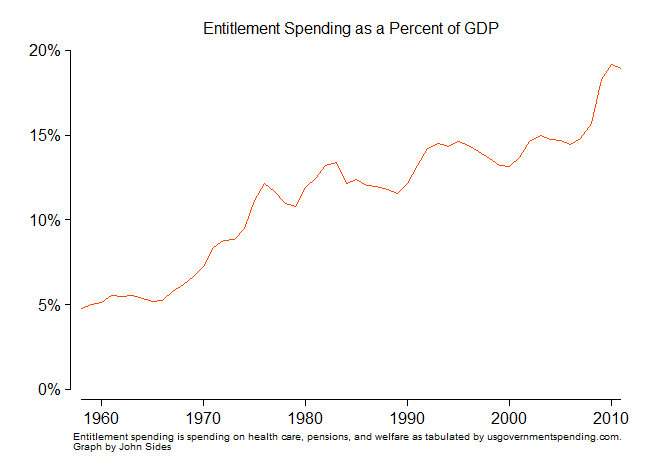 Third, the rise in entitlement spending grew much more after the 1960s and the Great Society than during. There is more growth in entitlements since 1974 than before. True, the second graph shows that the climb begins pre 2001. 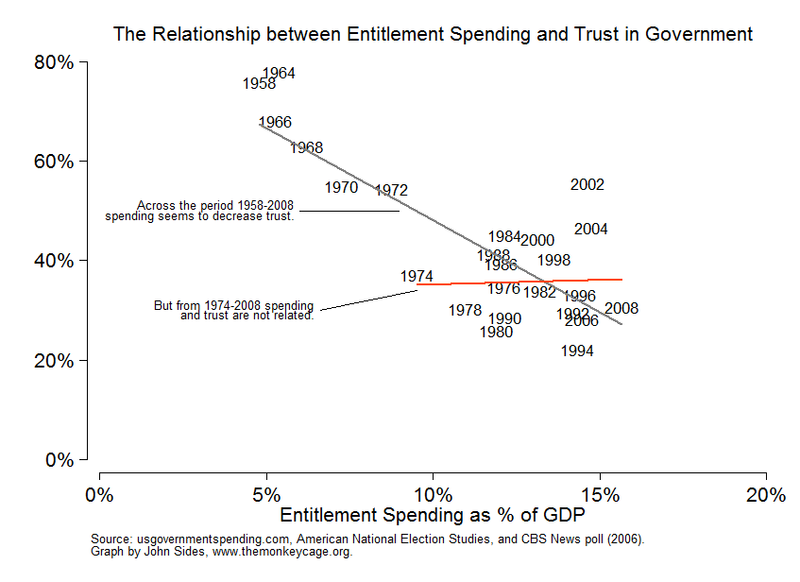 I was looking at the third graph, graphing trust against Entitlement GDP share with the years marking the points. In that graph 1996, 1998, and 2000 are very near the black (long run) trendline while 2002 and 2004 are quite far distant from it. My particular ‘criticism’ is to note that the red trendline is highly influenced by the 2002 and 2004 data points, both being outliers with an obvious cause exogenous to this relationship, and thus should be controlled for. Same with the black trendline, which would probably be steeper in the absence of the two 9/11-related outliers. I will note that from 1996 to 2000, entitlement share fell while trust rose, but as you say that particular adjustment probably more easily attributed to a good economy – both variables should be strongly correlated to economic performance independent of each other. It is hard to say what 2002 would have looked like without 9/11, given the economic mess of the dot.com bubble imploding just around that 2000-2002 timeframe. He may be wrong, but I do think this is one of the more interesting and important discussions to be having right now. I’d like to posit a different cause and effect loop. As industrial management techniques have been driven into public services (through call centres, automated voice recognition and shared services), the public services that people rely upon has moved physically further away from them. The state (as in a an entity their to serve and help its people) no longer has a human face. Public services have been industrialised and automated with unintended consequences. One of those consequences is that public services have increased in cost and not decreased. And if we don’t know who the state is in our day-to-day lives, of course we won’t trust them. That’s just my hypothesis, but read this as it might be of interest.